Reliquary CC BY-SA 3.0 by Wim Goossens, 12-13th century; Photo by Richard Nagy of Datamancer.net "The Clacker"
Author’s note: This first appeared about two years ago at my steampunk novel blog, The Aldersgate Cycle. At the time I was knee deep writing the book of that name, and spent long hours pondering the meaning of steampunk, especially related to culture and literature. Hot on the heels of my graduate degree (with a concentration in medieval English and the like) I was working on ways to connect the recent steampunk maker culture to the reliquary culture of the Middle Ages. I’m not sure it’s the most sound argument, but certainly is food for thought. For steampunk week, I thought it might be a slightly different subject to share. I’ve been pondering the connection between the modding movement (particularly steampunk, of course) and the art of reliquary making from the Middle Ages a great deal lately, and thought I’d share some general thoughts. While I’m not technically an art historian, the subject has always fascinated me, and the connections between art and literature are, of course, myriad. To begin, well, what is a reliquary? Simply put, a reliquary is a vessel, or housing, designed to fit holy objects-typically of a saint or a martyr-in order to enable worship, adoration, and experience. The actual structures varied immensely, from those small enough to house tiny locks of hair, teeth, and scraps of cloth, to large enough to compensate for entire bodies. While most people associate reliquaries with Catholic and Christian tradition, they are also very common in Hindu and Buddhist religions as well. What initially astonished me about reliquaries, when I began studying the art of the Middle Ages in Western Europe, was the diversity and grandeur to be found in various examples. So much of the artwork during this period seems watered down, simplified, lacking in luster (to some… this is a point I’d argue rather vehemently). But the reliquaries dazzle with their ornate scrollwork, precious metals, inlaid stones, and sense of individuality (not to mention… oddity). That these reliquaries were so adored is no surprise; people believed they could work miracles! And in contrast to the day-to-day life of a medieval peasant, yes, I imagine I would have thought the same thing, too. So, steampunk. Consider the word reverence: 1. a feeling or attitude of deep respect tinged with awe; veneration. Now, in this day and age, religious homogeneity is far from the norm. But we do revere our technology. And yet, alone, as a generic product of mass-production, our computers and iPods, our guitars, our phones-these things are not uniquely ours. Steampunk design has always striven to re-make, to re-apportion, to re-define the contents within. Because, like a finger-bone or lock of hair is indistinguishable without context, so too is your average computer/technology. Yet many of us feel compelled to read personalities into our own tech, striving to soften the edges of cold, hard, circuits. Granted steampunk artists tend to work in brass and wood, rivets and cogs, etc, and our medieval counterparts used gold, but the sentiment is surprisingly similar. Reliquaries house mysteries, and so, to some extent, to the mods of the steampunk aesthetic movement. What’s particularly divergent when comparing the two is that while reliquaries and reliquary making were relegated to churches and those in control of power (and, some would argue, the Diety in general…), steampunk is almost like modding your own god. It brings to mind old practices of pagan “house gods”-the sorts that inhabit your kitchen, your hearth, your bedroom, the objects that you interact with every day. I mean, no medieval peasant would ever be able to afford their own reliquary-let alone a relic (thought I bet there were some pretty clever folks who made a pretty penny playing into the system). This diversion is at the heart of steampunk, that it’s something accessible rather than distant, something to be claimed rather than something that claims you. That’s why the best the concentration is on aesthetic-the look of the final project-rather than worth, i.e. much of steampunk material is scavenged, recycled, etc. 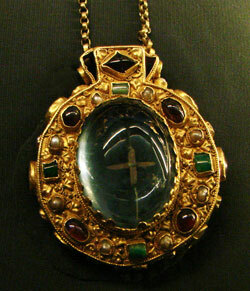 My personal favorite medieval reliquary, for those intrigued, is that of Saint Foi. Not only is she, essentially, a gold recreation (of sorts) of the original container for the bones (that would be Saint Foi herself), but the history behind the reliquary is fascinating and includes not only feuding medieval monks but also a series of thefts! More shiny pretty reliquaries here, for those intrigued! Datamancer has some excellent examples of steampunk/medieval crossover, including his Reliquary keyboard and “The Archbishop” PC housing. Is the steampunk embellishment of a computer a way to disguise it in a neo-victorian skin, or is a paean to the role it plays in the creator’s life? I am intrigued by the connection Ms. Barron has drawn to the tradition of reliquaries. While much of the elaborate items containing actual bits of saints were kept in churches, pilgrims aquired more affordable (and reproducible) mementos of saints in their travels, for example fabric soaked in oil poured over the sarcophagus, or rocks from holy sites. It seems there has always been a market for souvenirs.